Here's the good, the bad, and also the weird. So, I'm actually gonna kick it off with the weird. And that was the fact that Apple didn't update the 13-inch MacBook Pro without touch bar, or the 12-inch MacBook, or the MacBook Air, only the 13.5-inch MacBook Pro with the touch bar, which is cool, but kind of leaves us wondering. Now, stay with me, because this might get a little confusing, but what makes most sense to me would be to drop the Pro name from the 13-inch MacBook Pro without touch bar and then you have two options. You have the 12-inch MacBook, so you could then have the 12 and 13-inch MacBooks side-by-side, or the 13-inch MacBook Pro without touch bar gets a little thinner and becomes the 13-inch MacBook Air. With a 12-inch MacBook there is no need for an 11-inch MacBook Air, so the latter kinda makes most sense to me. You have the 12-inch MacBook, the 13-inch MacBook Air, and then finally the 13 and 15-inch MacBook Pros and that's a pretty solid lineup. Hopefully, that made sense, but now on to the good. The MacBook Pros that were updated now have Intel's 8th generation CPUs and if you listen closely, you can hear Dave 2D smiling all the way from Canada. (screeching) Now, what this does is kinda creates the first major shift to MacBook Pro specs in a really long time. The 13-inch MacBook Pro is now quad-core and the 15-inch MacBook Pro is now six-core, both for the first time ever. There's now True Tone displays on these MacBook Pros and that's where the display will actually change white balance based off the color temperature of the lights around you. So, that's great for everyday use and reading, not so much for editing, but definitely a welcome feature. Now, I'm not 100% sure on this, but it looks like Apple is claiming also better audio or speakers for these MacBook Pros, but I will definitely test that out once I get my hands on one. There's also the brand new T2 chip, which is gonna do huge things for security. I'll actually drop a link down below on why it's so important, but on top of that it's also gonna be in that hey Siri is ready at any given time. Now, again, the 13-inch MacBook Pro with touch bar is quad-core all the way across the board. So, every single configuration you can pick is quad-core, which is something I wanted forever. It feels like every time they've updated MacBook Pros, I've wished for a quad-core 13-inch MacBook Pro. So, that is awesome news. This ships with eight gigabytes or RAM, configurable up to 16 and as far as storage goes, you can max this out at two terabytes. So, a 13-inch MacBook Pro with a quad-core CPU and two terabytes of storage, I can't complain. The 15-inch MacBook Pro, that's where things get a little interesting, though. And that's where I am most excited, because it is now six-cores all the way across the board, from the entry-level 15-inch MacBook Pro. That is configured with an i7 CPU, but you can configure it all the way up to a 2.9 gigahertz six-core i9 CPU with turbo boost up to 4.8-- - Gigawatts. - So, that is really, really, really, really, really exciting for me having a six-core MacBook Pro with that kind of power. Now, as far as what the biggest difference between a 13 and 15-inch MacBook Pro are, yes, that i9 CPU is going to be insane. But, the one thing to remember is with the 15-inch MacBook Pro you get dedicated graphics across the board. Whereas, with this 13-inch MacBook Pro, you only get integrated. Also, with the 15-inch MacBook Pro, you can now finally configure up to 32 gigabytes of RAM, which I feel like is something people has wished for forever and a massive, crazy, insane, mind blowing, four terabytes of Pure flash SSD. Now, speaking of the four terabyte SSD, that has stirred up quite a few people on the Internet, because that upgrade alone is $3,200. So, with that I've seen people freaking out, to losing their minds saying holy bananas, the MacBook Pro costs nearly $10,000. For starters, it's about $6,700 before tax, which is crazy, but you still got a little ways to go before 10,000. And, secondly, and probably more important, you do not need to make that upgrade. The model that costs $3,099 will perform the exact same. It will be just as fast as the model that costs $6,700. The only thing you are paying for is the SSD, which comes down to speed and convenience. You could pick up a two terabyte Samsung external SSD for under 700 bucks, so that's a great way to save some money. But, the one thing to remember, is that it's actually must slower than the internal SSD inside the MacBook Pro. Alternatively, you could jump up to a four terabyte external RAID SSD from Gylph, but as you jump up in price and performance, up goes the price. This is 1600 bucks, so you can see when you compare that to the MacBook Pro, again, it's fast, but it's still about a third the speed of the internal SSD in the MacBook Pro. For those out there that are already buying a four terabyte SSD inside the MacBook Pro, they don't need convincing, and ultimately what it comes down to is convenience. For me, anytime I don't have to use an external drive is awesome, especially if you're on the road, if you're on a plane, not having to plug anything in and just using the laptop by itself is amazing. So, with that SSD craziness and the price and people freaking out, that makes a perfect transition to the bad. So, from what I've seen so far, the biggest complaints with new MacBook Pros are one, it's the same design, it's 2018, bezels are shrinking, they're getting smaller, they're disappearing on some phones, so why is it the same on these new MacBook Pros. Personally, I will wholeheartedly, with open arms, take the spec bump over a thinner bezel on the MacBook Pro, but it doesn't mean I don't want it. Next would be the lack of ports. We still have USB-C ports and that is it with these MacBook Pros. I would've hoped for, at the very least, maybe the return of the SD card slot. That is still something that is used very widely, but let me know if there were any port you could bring back to the MacBook Pro, which would it be and why. Jumping back to the display, I would've loved to have seen a bump in resolution. These are Pro machines, so we need more pixels. 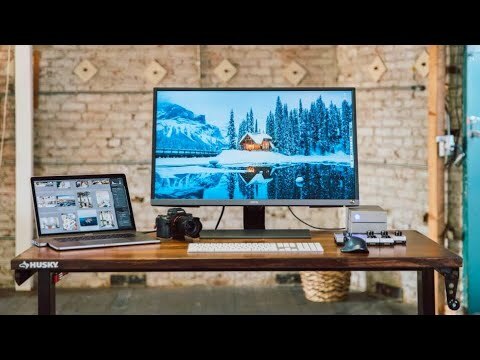 We have 5K displays in iMac Pros and the iMacs, so at the very least I would've loved to have seen a 4K display on these MacBook Pros. Finally, the number one thing I've seen people absolutely rip Apple for with these MacBook Pros is the butterfly keyboard. They put a lot of press and a lot of talk into them being quieter, but there's no mention of them being more reliable. If you had to cut, when recently Apple has gotten smacked in the face as far as those butterfly keyboards. And they've admitted that as far as reliability goes, they aren't the best. Over time, for example, dust will into your keyboard, the keys would stick and that became a big old mess. And I think, overall on top of that, people are really too happy with the lack of tactileness, the lack of clickiness with those butterfly keyboards, so it's not the most reassuring thing with these MacBook Pros, especially since you are dropping a ton of cash. Aside from that, the good, the bad, and the weird, this was a must, must, must-needed update to the MacBook Pros and I am stoked to get my hands on one. If you haven't yet, definitely subscribe for coverage on that, which should happen in the next day or two, an unboxing speed test and everything you could possibly want to know.